It sits among the palm trees and lavender bushes, close to the edge of Melrose Avenue. It grows in dry dirt. Across the street from the arches of Paramount Studios, this fig tree lives, propped up by wooden sticks, tended to by neighbors and passersby. The tree stands solid, green with life, ever ready to grow its fruit. And grow it does, waiting for the rain that doesn’t come within the parched end of a drought. It sits waiting for its green bulbs to turn sticky purple, ready for the plucking. And pluck them we do – my work colleague and I. We keep our eyes on the tree and its new growth for weeks during lunch hours when we leave the lot to take a walk away from the hustle of production crews, crowded parking, silly people and ringing phones. A nice respite away from Hollywood madness. 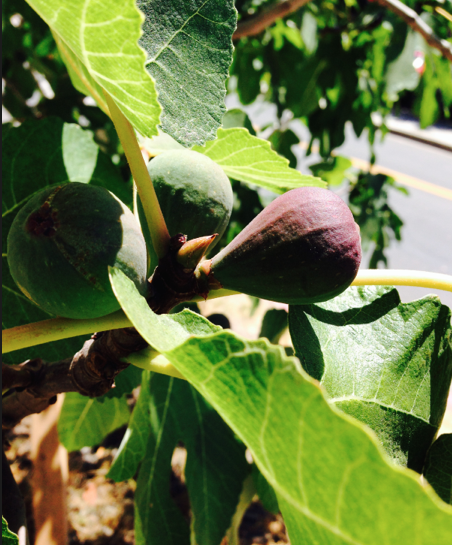 A little tree on the edge of a busy street, growing fresh figs for salad, waiting for a little rain.